In 1949 if you had wanted to know about rural life in Iowa, you would have looked to Evelyn Birkby, the newspaper columnist, author, and radio personality who for almost 60 years shared stories of farm life, recipes and tales from her own country kitchen. Evelyn was also one of the famed “Radio Homemakers” who, for 40 years broadcast across a five-state area on radio station KMA in Shenandoah, Iowa. (In the 1950s, domesticity dominated the lives of most rural Iowa women. Somewhat isolated on the farm, many relied on the radio to hear a friendly voice. The KMA Radio Homemakers were the ones they turned to for advice and information about cooking, gardening, household hints and beauty tips.) Evelyn Birkby was by far the most popular of the “neighbors on the air,” helping women with everything from menu planning to child rearing. For more than a quarter century Evelyn was a regular monthly columnist for Kitchen-Klatter Magazine, and broadcast on the syndicated Kitchen-Klatter radio program. Since 1949, she written a weekly column on rural Iowa life called Up a Country Lane. Birkby is the author of ten books. Neighboring on the Air describes the heyday of the radio homemakers. Her book Up a Country Lane stitches together stories, photographs and recipes from Iowa farm life in the 1940s and 1950s. 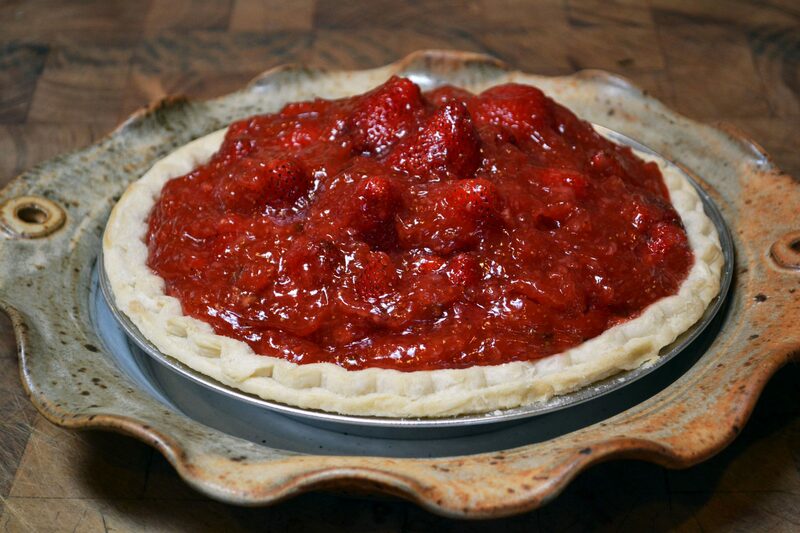 The Strawberry Pie in Up a Country Lane is reflective of all of the recipes in the cookbook. They are fun, simple, and were often sent in to Evelyn from her adoring radio fans and newspaper readers. While so many recipes for Strawberry Pie use a strawberry gelatin as a thickener, the natural pureed strawberries in this version really gives this pie a through and through fresh strawberry flavor. Enjoy a little neighborly Iowa hospitality with Evelyn Birkby’s refreshing summertime favorite! Preheat oven to 350 degrees. Sprinkle 2 teaspoons of sugar over pie shell and bake for about 15 minutes or until lightly golden brown. When done, arrange 4 cups of whole strawberries in pie shell, point up. With a small food processor, fork or potato masher, thoroughly puree remaining 2 cups strawberries and combine with cup of sugar in a medium saucepan. Add lemon juice. Cook over medium heat and bring to a boil, stirring frequently. In a small bowl or measuring cup, whisk together cornstarch and water. Gradually stir cornstarch mixture into boiling strawberry mixture. Reduce heat and simmer mixture until thickened, about 5-6 minutes, stirring often. Pour mixture over berries in pastry shell. Chill for several hours before serving. In a small bowl, whip cream and powdered sugar until firm peaks form. Serve each slice of pie with a dollop of whipped cream.